If you are the kind of person who doesn’t go anywhere without at least one sports team’s logo emblazoned on your shirt, jacket, coffee mug or car, you may also be a collector of sports flags and banners. Sports flags and banners, especially from college teams, are among the most popular ways to support your favorite local team or alma mater. But until now, it was difficult to find a good selection of high quality sports flags. Surprisingly, the best team sports flags and banners are not sold in sporting goods stores or at the game; they are made by professional flag manufacturers and purchased online. The same thing is true with college flags. 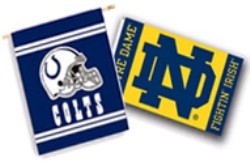 Instead of paying top dollar at a sporting event or college bookstore, it is possible to find a variety of officially licensed college banners and pennants in the school’s official colors, made from durable indoor/outdoor fabric. If you’re a real sports fan, you know that no matter how well or how poorly your team is doing, you will continue to wear your favorite team jersey, drink out of your team coffee mug, and drive around with a team flag waving from your car window. All of these are great, and there are plenty of ways to show loyalty to a team, but for avid sports lovers sports flags and banners are the best way to show support for your hometown heroes. 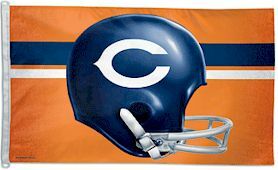 When you buy sports flag, sports banners, and other team memorabilia from a vendor at the game, you are often left with a cheaply made flag that quickly fades in the sun. That’s why so many fans are starting to purchase sports flags and banners from a reputable flag manufacturer instead. 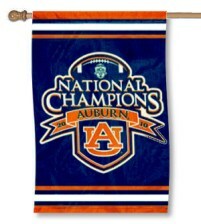 With such a large selection of sports flags and banners available online, you can quickly find sports banners in several different sizes and have them shipped directly to your home along with flag poles, hardware, and other mounting accessories. Until recently, the craziest fans out there were NFL football fans, but it seems that the NHL fans are quickly gaining ground. Sports fans everywhere are known for supporting their favorite team by wearing jerseys, drinking out of team logo mugs and decorating their houses with team colors. On game day, it’s not unusual to see fans decked out in the jersey of their favorite player, with hair dyed and face painted to match their team’s colors. Brisk sales of hockey flags, hockey banners and NHL pennants indicate that NHL fans are getting their game faces on for a “banner” year. However, the question still remains, which team has the most loyal fans? Is it the orange and black “Broad Street Bullies”, aka the Philadelphia Flyers? Or is it the perennial post-season heroes on the Detroit Redwings who get that distinction? Some would argue that the “comeback kids” and 2010 Stanley Cup winners known as the Chicago Blackhawks have earned a larger stake among their tireless fans But it doesn’t matter if you love the New York Islanders, the Florida Panthers, or the New Jersey Devils, hockey flags are quickly becoming a “must have” for NHL fans. With the holiday season quickly approaching, expect to see hockey flags and NHL banners of every variety on the wish lists of diehard fans. 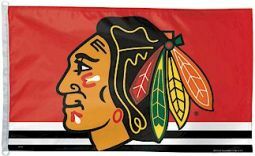 NHL hockey flags are available in various sizes and shapes, but the most popular size is a 3’ x 5’ outdoor flag. They are made from durable indoor/outdoor polyester with screen-printed or embroidered insignias, heading and grommets. 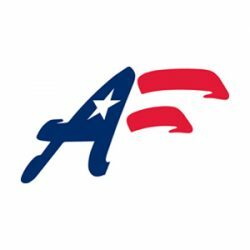 For the best selection of affordable NHL hockey flags and NHL banners, visit FlagPro.com, home of the FLAGPRO ® Flag Store. They have been making the highest quality flags, flagpoles and accessories since 1936.